A Massachusetts man was arrested in New York City Thursday morning by federal authorities after allegedly threatening Immigration and Customs Enforcement agents on social media, according to authorities. Marc Santia reports. A Massachusetts man was arrested in New York City Thursday morning by federal authorities after allegedly threatening Immigration and Customs Enforcement agents on social media, according to authorities. Brandon Ziobrowski, of Cambridge Massachusetts, was arrested by the FBI's Joint Terrorism Task Force at 7:15 a.m. on a street corner in Queens. Video obtained exclusively by News 4 New York shows the takedown, as Ziobrowski, wearing shorts and a blue shirt, paces on a street corner while unmarked cars loop around -- and suddenly, federal agents from all directions approach him. One shakes his hand, while the rest of the agents put him in handcuffs. The arrest is in connection to his alleged tweet under the username @Vine_II in which he wrote he was willing "give $500 to anyone who kills an ICE agent," according to the indictment. "I am broke but I will scrounge and literally give $500 to anyone who kills an ice agent," he allegedly wrote online on July 2. "@me seriously who else can pledge get in on this let's make this work." Court documents say that this tweet was designed to “encourage violence and the murder of law enforcement agents” and that Ziobrowski “intended that his tweet communicate a threat and knew that it would be interpreted” as such. The indictment also said the 33-year-old once tweeted he wanted to "slit" U.S. Sen. John McCain's throat. "To have people posting on social media trying to incite others to bring harm to the agents, it's something that we take very seriously, because it not only affects the agents, it affects their families at home, their children, their husbands, their wives, their mothers and fathers," said Anthony Scandiffio, deputy special agent in charge at Homeland Security Investigations. At the request of law enforcement, Ziobrowski's Twitter account was suspended later in July, necn.com reports. U.S. Attorney Andrew Lelling, FBI's Special Agent in Charge Harold Shaw and Homeland Security's Special Agent in Charge Peter Fitzhugh announced the case against Ziobrowski at Moakley Federal Courthouse in Boston Thursday morning. 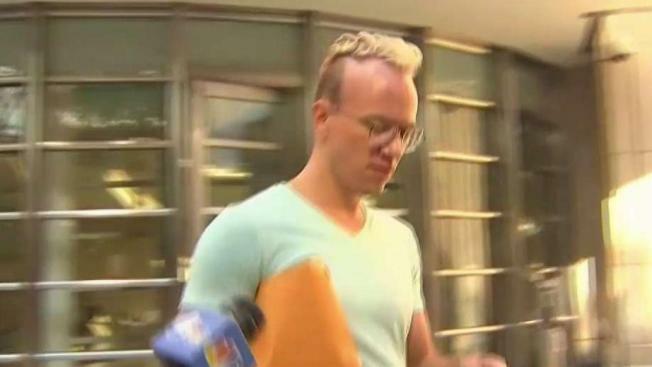 Ziobrowski is expected to be arraigned Thursday in Brooklyn federal court before his removal to Boston on the charge of using interstate commerce to transmit a threat to injure another. "We are going to take these threats very serious and if you feel you are going to post something against an ice agent to bring harm to an ice agent we will track you down and we will investigate that," said Scandiffio. If found guilty Ziobrowski could face up to five years in prison, three years of supervised release and a fine of $250,000. It's unclear if Ziobrowski has an attorney.